Holding both the coal-rich Appalachian Mountains and the Marcellus Shale, Pennsylvania is rich in both coal and natural gas. “Although the state is among the top 10 consumers of coal, natural gas, petroleum products, and electricity, it is the second largest net supplier of total energy to other states,” says the Energy Information Administration. Pennsylvania is the third-highest electricity producer among all states in the U.S., trailing behind only Florida and Texas. It often produces more than it consumes, allowing the Keystone State to supply electricity to other Mid-Atlantic states. 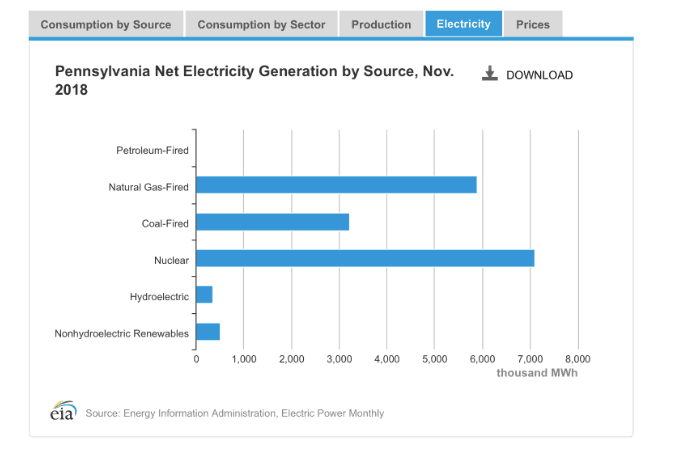 Nuclear power is the largest share of Pennsylvania’s electricity – in fact, Pennsylvania is second only to Illinois in nuclear electricity generation, says the EIA. In 2017, nuclear powered 42% of the state’s electricity. However, nuclear power must contend with increasingly competitive natural gas. The notorious Three Mile Island nuclear power plant may close in September of 2019, according to the Pittsburgh Post-Gazette. In early 2019, state legislators are proposing bills that could help nuclear stay competitive in the current market. “The legislators propose to integrate nuclear power into the state’s existing Alternative Energy Portfolio Standards Act, a 2004 law that requires power companies to get an increasing percentage of their electricity from sources like wind, solar, hydropower, landfill methane, and waste coal,” says the Post-Gazette. “Built on coal, Pennsylvania has increasingly become a natural gas state,” says Forbes. Natural gas has become more and more competitive with coal in the energy marketplace in recent years. “In 2016, natural gas supplied almost 33% of Pennsylvania’s electricity, a powerful leap from just 8% in 2007,” Forbes continues. In the past several years, natural gas has surpassed coal in terms of electricity generation, says the EIA. The state plans to increase investment in natural gas in the coming years. While coal powered half of Pennsylvania’s electricity in 2010, it fueled only a quarter of all electricity production in 2017. In fact, 11 power plants shut down their coal-powered electricity generating equipment between those years, while three other plants made the switch to natural gas. As it has made way for greener forms of energy, Pennsylvania has experienced a substantial drop in emissions since 2005, according to the Center for Strategic and International Studies. Currently, renewables power about 5% of the state’s electricity generation. Wind power fuels two-fifths of that total, while hydropower, biomass, and solar also make up part of the state’s green energy portfolio. Pennsylvania now houses 27 wind farms, which produce 1,300 megawatts of electricity – enough to power almost 350,000 homes with greener energy. By 2021, the Keystone State aims to produce 18% of its electricity from renewable sources. Pennsylvania’s energy landscape is shifting fast. If you’re interested in where your power comes, stay abreast of emerging changes in the legislature that may support the development of renewable energy industries.